Rush Order Processing means your tiller order will be fast-tracked and you'll be tilling in no time. Rather than waiting when you've got tilling to do now, just invest in rush order processing so you can jump to the front of the line. Your order will be given top priority and shipped ahead of others so you have it much sooner. In the spring and summer months, tillers sell faster than playoff tickets. Our inventory literally disappears in hours instead of days. By ordering Rush Order Processing for a $50 service fee, your garden tiller is instantly reserved – securing it exclusively for you. Rush Order Processing is only available on “In-Stock” tillers. If rush order processing isn’t available, the rototiller is sold out or backordered. It’s physically impossible to ship an entire warehouse in one day. 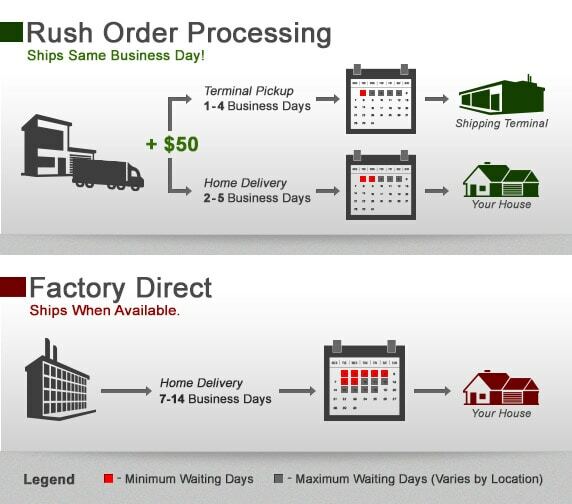 With Rush Order Processing, your order is shipped immediately. Your tiller will ship the same business day if ordered before 4 p.m. EST M-F. Weekend and evening orders will be shipped the next business day. You will receive a tracking number the moment your tiller ships. We will also provide you with the freight carrier’s phone number, so you can contact them directly if necessary. If the need is gone before your tiller arrives, congratulations. Your tiller will be delivered in a few days, and you’ll be prepared to tame your garden. If not, you are welcome to pick it up at the freight carrier’s local terminal, significantly reducing your lead time. Just call ahead, and let them know you’re coming. Tiller Rush Order Processing - Find Out How to Quickly Receive Your Tiller. Our rototiller how-to library can help you pick the perfect electric cultivator, gas cultivator, front tine rototiller, rear tine garden tiller or garden tiller accessory.